Homeopathic Attention Support in Easy to Swallow Capsules! 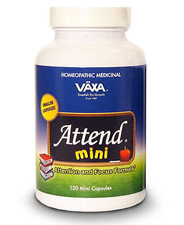 VÄXA Attend™ mini is a doctor-formulated homeopathic medicinal specifically engineered to help support the function of the Central Nervous System (CNS) in individuals who want support for attention levels. This formula supports the body to balance both neural growth and neurotransmitter production. For years VÄXA Attend has been providing children and adults attention support. Now, VÄXA introduces Attend mini which provides the same effective formula as Attend in smaller, easier to swallow capsules for those who have difficulty or an aversion to swallowing capsules. Named for its miniature size, Attend mini allows children, teens, and adults struggling with attention to have the opportunity to experience the benefits of Attend, without struggling with the hassles of capsule size. Nothing should hold you back from obtaining the attention support you desire and deserve. Like the original Attend, Attend mini is a doctor-formulated homeopathic medicinal specifically engineered to support the function of the Central Nervous System (CNS). Are There Any Side-Effects With Attend? Does it Contain Stimulants? No, Attend has no side-effects. It is safe, non-toxic, and contains no stimulants. Plus, it is free of gluten. It is important to note that Attend will not put a person to sleep or make them drowsy. How Long Does VÄXA Attend Take to Work? Most people who do not have a medical condition can see benefits in as little as two weeks, whereas those with certain conditions can take a couple of months to see outward results. However, Attend begins to work from the moment you take it. Outward noticeable results may take several days to several weeks depending on the person and their overall health. Attend does have a loading usage which varies based on weight. Although it is not mandatory, it is encouraged for maximum benefit. VÄXA Attend contains homeopathic ingredients officially listed in the Homeopathic Pharmacopoeia of the United States (HPUS). Medium Chain Triglycerides, L-Tyrosine, Alpha-Linolenic Acid, Green Tea Extract, Trifolium Pratense, Flax Seed Powder, Phosphatidycholine, Phosphatidylethanolamine, Phosphatidylinositol, EPA, L-Isoleucine, L-Leucine, L-Valine, DL-Methionine, L-Glutamic Acid, GABA, DMAE, Ginkgo Biloba, DHA, Conjugated Linoleic Acid, Eicosatrienoic Acid (from GLA powder), Arachidonic Acid, Glycine, DL-Phenylalanine, Radix Heraclei, Caproic Acid, Caprylic Acid, Capric Acid, Alpha Lipoic Acid, Lauric Acid, Pentadecanoic Acid, Myristic Acid, Palmitic Acid, Palmitoleic Acid, Stearic Acid, Arachidic Acid (from GLA powder), Oleic Acid, L-Glutathione, DiCalcium Pantothenate, Magnesium Aspartate, Zinc, Niacinamide, Pyridoxine, L-Cysteine, L-Cystine, Pycnogenol, Gotu Kola, Phosphatidylserine, NADH, L-5HTP, and Chromium Nicotinate, Gelatin, Rice Flour and Dextrose. Children loading usage, take twice daily for 30-45 days or as directed by a physician. 30 to 50 lbs - 1 to 2 capsules, 50 to 70 lbs - 2 to 3 capsules, and 70 to 100 lbs - 3 to 4 capsules. After the loading time is complete the usage may be cut in half. Best taken 20 minutes before or after a meal.